ACS Nano 10 (9), pp 8888–8894 (2016). 김준성 (제1저자 김소영), 김태환, 민병일 교수 연구실은 준이차원 물질인 Ta2NiSe5의 엑시톤 응축 상태의 특성을 규명하였다. 연구결과는 ACS Nano 에 2016. 9. 27일자로 게재되었다. 반도체에서 전자와 홀의 결합으로 형성되는 엑시톤은 반도체갭의 크기가 매우 작을 때 자발적 응축상태를 만들게 된다. 이 연구에서는 반데르발스 물질인 Ta2NiSe5에서 발현되는 엑시톤 응축상태가 2차원 층에 국소화되어 나타난다는 실험적인 증거를 기계적 박리를 통해 얻은 2차원 물질 특성변화 관측을 통해 제시하였다. 이 결과는 2차원 물질의 특이 기저상태를 이해하는데 중요한 기초를 제공할 것으로 기대된다. Atomically thin nanosheets, as recently realized using van der Waals layered materials, offer a versatile platform for studying the stability and tunability of the correlated electron phases in the reduced dimension. Here, we investigate a thickness-dependent excitonic insulating (EI) phase on a layered ternary chalcogenide Ta2NiSe5. Using Raman spectroscopy, scanning tunneling spectroscopy, and in-plane transport measurements, we found no significant changes in crystalline and electronic structures as well as disorder strength in ultrathin Ta2NiSe5 crystals with a thickness down to five layers. 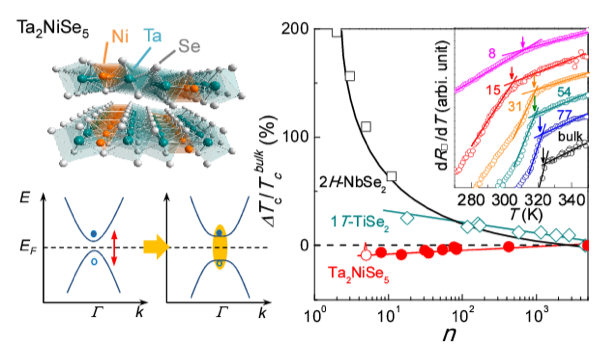 The transition temperature, Tc, of ultrathin Ta2NiSe5 is reduced from its bulk value by ΔTc/Tcbulk ≈ −9%, which strongly contrasts the case of 1T-TiSe2, another excitonic insulator candidate, showing an increase of Tc by ΔTc/Tcbulk ≈ +30%. This difference is attributed to the dominance of interband Coulomb interaction over electron–phonon interaction and its zero-ordering wave vector due to the direct band gap structure of Ta2NiSe5. The out-of-plane correlating length of the EI phase is estimated to have monolayer thickness, suggesting that the EI phase in Ta2NiSe5 is highly layer-confined and in the strong coupling limit.